The House Ways and Means Committee discusses a 2-cent-per-ounce tax on sugar-sweetened beverages earlier this month. As an open revolt over the state budget and tax bills took place on the House floor this week, a quieter standoff over health-care spending was playing out elsewhere in the Statehouse. How much should the state spend to improve access to health care? And how should it raise the money to pay for it? Two House committees have been paralyzed over those questions for more than a week, while the window for passage begins to close. Earlier this month, the House Committee on Health Care voted for a $52 million package financed with two new taxes: a 0.3 percent payroll tax and a 2-cent-per-ounce tax on sugar-sweetened beverages. It would also do away with an existing tax on businesses that don't provide health insurance to their employees. Not long after the bill reached the House Ways and Means Committee, however, House leaders sent word back to the health care committee: Chop the package down to $20 million. It’s unclear who picked the $20 million figure, or whether it’s a firm one, but both committees are operating as if that's the target. “It was very clear we weren’t going to do $52 million,” said Rep. Janet Ancel (D-Calais), who chairs the ways and means committee. By the time her panel took up the bill, it had already voted to raise $33 million for the general fund and $8 million for a new water cleanup fund. Her committee couldn’t stomach another $52 million, she said. By week’s end, though, the splintered health care committee had yet to figure out which part of its package to send to the cutting-room floor. “It’s a matter of priorities,” he said. His committee’s $52 million bill would, among other things, increase reimbursements to Medicaid providers — a priority of Gov. Peter Shumlin's administration — and enhance cost-sharing subsidies for low-income Vermonters. While both committees have been discussing the issue, most of the negotiations appear to be going on behind closed doors with House Speaker Shap Smith (D-Morristown). Friday, Lippert said he was waiting for the ways and means committee to decide how much money it was willing to raise before he put those priorities on paper. “I’m not going to lay something out there until there are further conversations,” he said. Ancel, whose committee has been busy with the bigger tax bill on the floor, said Thursday that ways and means couldn’t raise the money until Lippert’s decided what it needed. But the reality, Ancel acknowledged, was that her committee was also stuck. Its members can’t agree on how, or perhaps even whether, to raise $20 million. 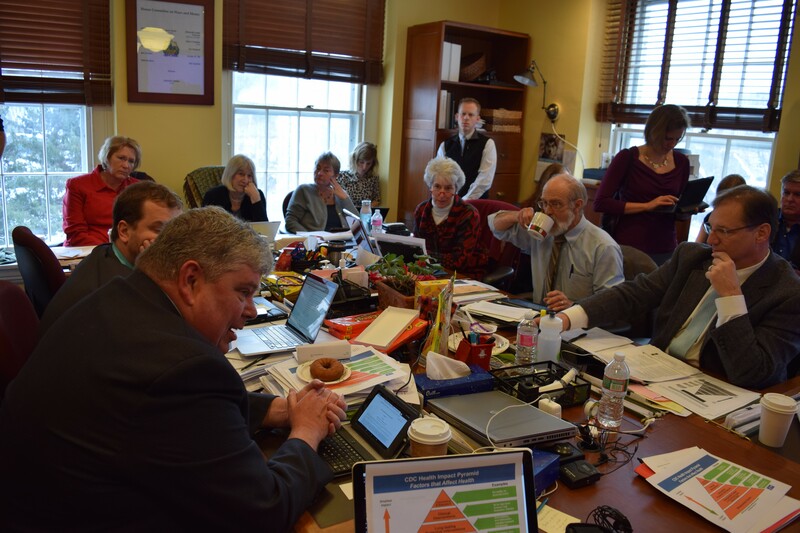 Last week, committee member George Till (D-Jericho) proposed levying a more modest, 0.75-cent per ounce tax on sugar-sweetened beverages, removing the sales tax exemption on candy and restoring the employer assessment that the health care committee proposed nixing. All that would raise about $20 million, he said. He lacked enough support to even bring the proposal to a committee vote. “That assumes we want to spend $20 million,” said committee member Allison Clarkson (D-Woodstock). "That’s a big assumption." Committee member Sam Young (D-Glover) said he’s opposed to the health care committee’s 2-cent-per-ounce soda tax because it’s too high. “I may in the end support a half-penny. I’m not there yet,” he said. Young said he’s not sure he can swallow $20 million in new taxes, no matter how it's done. “I think it’s more than I want to raise,” he said. Back in the House Health Care Committee, vice chair Chris Pearson (P-Burlington) said the idea behind the 2-cent-per-ounce tax was that it would encourage people to make healthier choices. Ways and means heard testimony, however, that the 2-cent excise tax would be paid at the wholesale level, making it unlikely that consumers would directly connect the soda and the tax. Ancel said she’d like to find a solution that can win more than a bare majority of the 11-member committee. If the bill limps out of her committee, it’s unlikely to survive the remaining legislative process. “I would like to see something move,” she said.